Hans Grohe is becoming a pioneer in the sanitation industry – and has been shaping shower culture since 1901. With its brands Hansgrohe and Axor the company represents high-quality, design-oriented products around the world, as well as trendsetting bathroom concepts and environmentally-friendly sanitation technologies. The recipe for success: tradition-based innovation coupled with sustainable corporate thinking – all enhanced by our great passion for the element water. 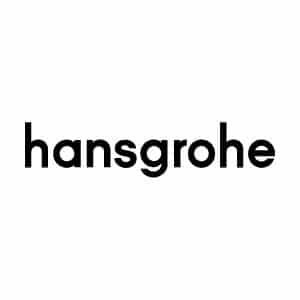 Within the international Hansgrohe Group, Hansgrohe is the premium brand for bathroom and kitchen fixtures, showers and shower systems as well as thermostat and plumbing technology. Winners of numerous awards throughout the world, the brand’s products stand for modern technologies, innovative design and a superlative level of functional quality. This explains the success of the brand as a market leader in the shower segment and as one of the leading manufacturers of fixtures. With inventions such as the shower bar, adjustable spray types, the QuickClean function, the AirPower or the EcoSmart technology as well as the convenient Select technology, Hansgrohe is regarded as one of the leading innovators in the international sanitation industry. Hansgrohe can look back on a rich culture of innovation. Many concepts and solutions developed and designed at Hansgrohe have provided incentives for the international sanitary industry. The bathroom professionals achieve around a third of their total turnover with new products. Around 80% of Hansgrohe production takes place in Southern Germany: in six plants in the Black Forest. The mixer and shower manufacturer delivers to around 130 countries on all continents and more than 80 percent of its sales are generated abroad. The question is, why does a company with such a broad international base still produce in Germany – when it would seem to be more cost-effective to produce all over the world? The answer from the Black Forest is: “because we count on German expertise and offer our customers a guarantee of quality”. Hansgrohe is a “green” company by conviction. This stands for: waste management (recycling rate 85 %), manufacturing processes (optimized use of energy, water and chemicals), product development (e.g. spray laboratory) and the use of renewable energies (solar power and heat recovery). According to our conviction we develop our products with the latest technology to conserve resources. Hansgrohe mixers and showers, which are fitted with the EcoSmart technology, require up to 60% less water than conventional products – and without any loss of comfort. Lower hot water consumption means lower energy requirement. Creative ideas are at home at Hansgrohe. 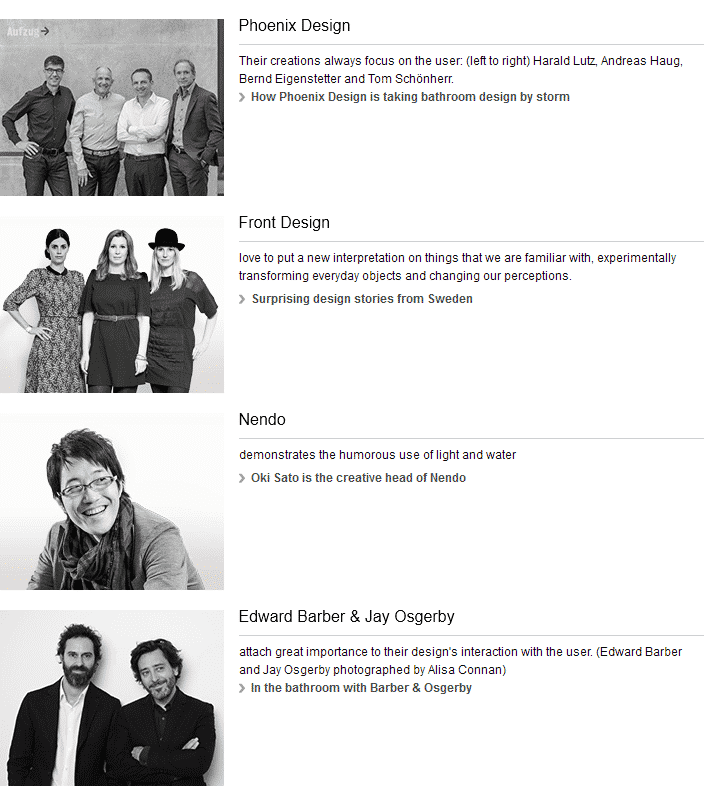 The company attracts globally successful designers. 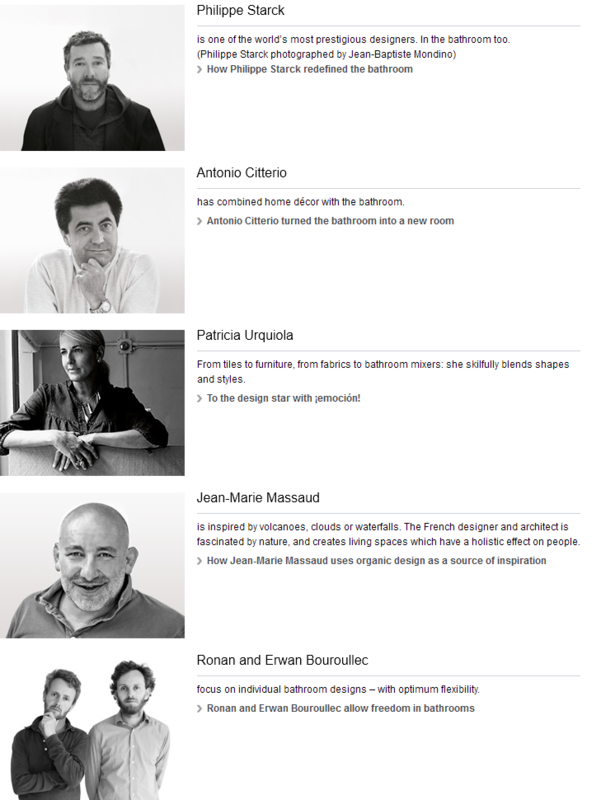 It hosts workshops with renowned creative minds and designers who develop visions of the bathroom of the future. In recent years, this clear commitment to the creative process has won Hansgrohe SE more than 300 awards from all around the world. The ‘iF awards’ from International Forum Design (iF) are among the most important indicators of product and design quality. Hansgrohe SE is regularly among the winners of iF competitions. Since 2008, the independent institution has also produced a ranking table indicating companies’ level of success in the design competition for the ‘iF award’: Hansgrohe SE currently ranks 6th out of approximately 1,900 companies. In doing so, it is above top brands such as Daimler, Audi, Hewlett Packard, Nokia and Volkswagen and number one in the sanitation sector. The Hansgrohe Group employs more than 3,200 people across all the countries in its subsidiaries situated in 37 countries. Local contact persons and a global networking are the driving forces for the successful realization of you plans. Tell us your requirement and we are there for you – all over the world! 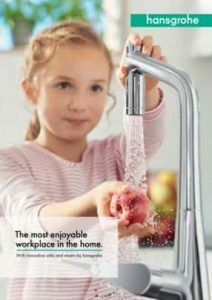 NEED MORE HANSGROHE INFORMATION ?